Winona Ryder and Marc Jacobs replaying Taylor and Burton (2011). Image Source: Winona Ryder.org. Caption for the above photograph: "You’re not man enough. You haven’t the guts.” Winona Ryder’s Elizabeth Taylor with Marc Jacobs’s Richard Burton. Harper’s Bazaar’s March issue features a stunning spread capturing iconic scenes from films directed by Mike Nichols, with stars including Marc Jacobs and Winona Ryder reenacting Who’s Afraid of Virginia Woolf? Since Elizabeth Taylor sadly died on 23 March, several reports on her life have said that she was the last of the great cinematic stars. Tonight, commentators on CNN put it very well: she was the last of the big stars who were known to the public before the advent of television. After that, stardom was watered down during the television age. The originals, Taylor and Burton © Warner Bros. (1966). Movie stars embody certain types of people and each new generation spawns look-alikes, Doppelgänger, who rise in their turn. It's a strange Wheel of Fortune that sees actors repeatedly transform into archetypes. I think this repeating pattern probably also happens in most human social settings outside Hollywood. Given the length of time that cinema has been around, some stars were the originals in this process - and everyone who comes after follows in their footsteps. The top photograph was featured in the March 2011 issue of Harper's Bazaar, but was taken and released prior to Elizabeth Taylor's death, which I blogged about here. But when you look at differences, you can see the gulf that exists between Taylor's heyday and our own. Another two photos are below the jump. Computer chip with four superconducting qubits. Credit: Image Courtesy of Erik Lucero (2011) via BBC. Caption for the above photograph: This computer chip includes four superconducting qubits that comprise a quantum mechanical version of a computer microprocessor. Quantum computers are expected to be able to solve various problems that are far too difficult to be handled by conventional computers. The 6cm-by-6cm chip holds nine quantum devices, among them four "quantum bits" that do the calculations. The team said further scaling up to 10 qubits should be possible this year. The team's key innovation was to find a way to completely disconnect - or "decouple" - interactions between the elements of their quantum circuit. The delicate quantum states the team creates in their qubits - in this case paired superconducors known as Josephson junctions - must be manipulated, moved, and stored without destroying them. Britton Plourde, a quantum computing researcher from the University of Syracuse, said that the field has progressed markedly in recent years. The metric of interest to quantum computing is how long the delicate quantum states can be preserved, and Dr Plourde noted that time had increased a thousand fold since the field's inception. "The world of superconducting quantum bits didn't even exist 10 years ago, and now they can control [these states] to almost arbitrary precision." The abstract for the paper is here. Elizabeth Taylor in Suddenly, Last Summer (1959). Columbia Pictures. Image Source: The Oscar Nerd. Just the other day, I thought to myself that when Elizabeth Taylor dies that will really mark the end of that generation of big stars who graced the big screen in the immediate post-War era. Noted for her two marriages to Richard Burton, her violet eyes, her stunning beauty, six other husbands, her terrible health problems and incredible resilience, a love of diamonds, and deep dedication to charity, she was one of the most famous actresses of the twentieth century. 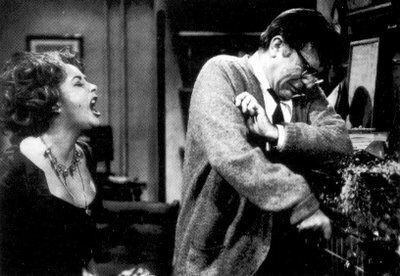 I found her chemistry with Burton to be eternal, especially because the pair were passionate, terrible, destructive, and incredibly funny together. Taylor passed away earlier today in Los Angeles. Image Source: Alcove via Rider on the Storm. 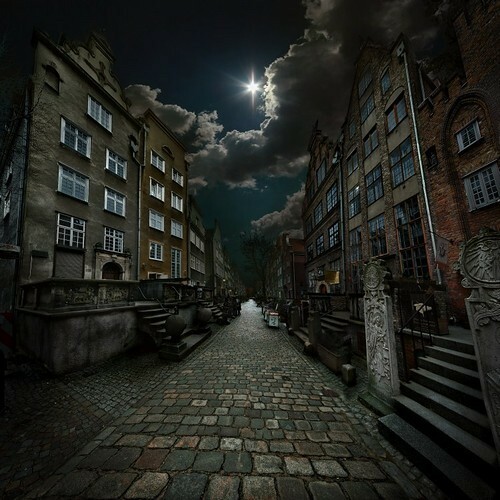 Night photography gives us a glimpse of the private lives things have when no one is looking at them. This is a sleeping world of dreams. Yet these images are not about the Self, which for perhaps two centuries has increasingly come to dominate everything. Aided by technology, photographers are able to achieve what one of my friends referred to as "objects stripped of their subjectivity." These are photographs that reflect the collective (not the individual) unconscious and subconscious. It's tempting to say these scenes look dead - that time in them has stopped - but I think these images instead capture time in stasis. This is life when you press the Pause button. While I mostly avoided the glamorous urban night photos and popular night photos of city skylines, I just could not resist this whopper of the entire Hong Kong skyline - go here. Villemard (1910) - En L'An 2000 - At School. A few days ago, I picked up on an I09 review of the Millennial Web comic Tozo - The Public Servant (see my post here). To better grasp Retro-Futurism, I want to compare Tozo to a collection of postcards from 1910, in which the French artist Villemard envisioned the year 2000. In this case, a fin-de-siècle Futurist closely resembles the work of a turn-of-the-Millennium Retro-Futurist. Villemard's collection has been making the rounds on the Web for about two years. It is housed at the Bibliothèque nationale de France (BnF; French National Library); but it has been carried on - among other sites - Flickr, The Pursuitist, We are Replicants, The Society Pages, The Utopianist, Selectism, Boing Boing, BldgBlog, and A Cultivated Mindset, (many thanks to J. for the reference). These sites all picked up on the charm of an outdated futurist. But they did not explain why those images resonate so much now and why they are so popular on temporally-oriented Websites like How to be a Retronaut. 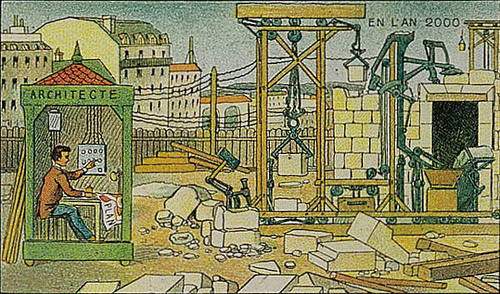 Villemard (1910) - En L'An 2000 - Chantier de construction électrique. Two things strike me about this 1910 collection. First, Villemard's understanding of the future shows us just how impossible it is for us to accurately predict what things will be like, even one short century from now. That means we should look at current claims, such as those from Boomer futurist Ray Kurzweil and other wild hypotheses regarding the Technological Singularity, with some skepticism. For a recent Transhumanist critique of Millennial Futurists, go here. 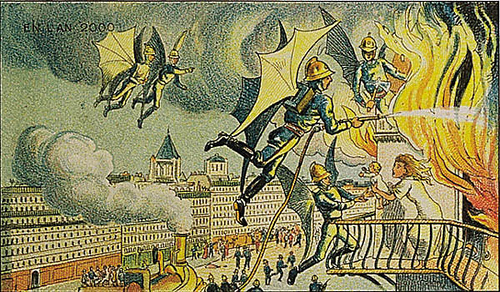 Villemard (1910) - En L'An 2000 - Air Firemen. Second, while Villemard's 1910 predictions were eerily correct in some respects and wildly off in others as far as our daily reality in 2000 went, his pictures accurately predicted the Millennial taste for Retro-Futurism. Villemard's images closely match our illustrations of the future as we gaze back toward the past. The past looks toward the future; the present looks toward the past (with an eye on the future! ); and the two views overlap almost exactly. Knut on the day his two millionth visitor came to see him (October 2007). Image Source: AFP via BBC. The world news is in such a state right now that animal interest stories take some time to penetrate the clamour. It's with sadness that I heard today of the unexpected and premature death of this lonely and much-loved German polar bear on March 19. The cause of the bear's collapse and death is being investigated today; it was witnessed by some 600-700 people. It's speculated that his recent confinement with three female bears, including his mother, Tosca, might be a factor (see here and here). For a time, Knut was the poster animal for our concerns about the environment and our hopes that we could protect endangered species through human rearing. Perhaps his death reflects other reports that polar bears are members of a complex and volatile species that cannot fit easily with human interaction. 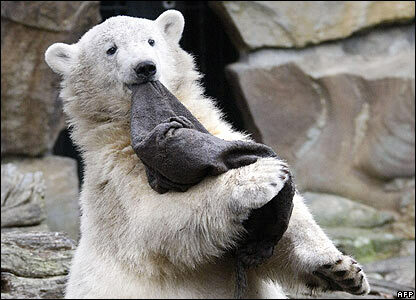 Knut became a strange celebrity in an era where the internet can make anyone and anything world famous in minutes. I found him to be a completely sympathetic and compelling unwilling star. The Website of the Berlin Zoo is here; as of March 21, the online memorial book for the bear had garnered over 2,400 signatures, here. Addendum from Time (23 March 2011): "On Tuesday [22 March 2011], officials at the Berlin Zoo confirmed the preliminary results of the post-mortem, revealing that Knut was suffering from a brain disorder which led to his death. "The initial results show significant changes in the brain which could be regarded as the reason for the polar bear's sudden death," the zoo said in a statement. Further tests will be carried out in the next few days. In the meantime, zoo directors have hit back at any claims of negligence." For my earlier post on Knut, go here. Spring is here! The Vernal Equinox starts today at 23:21 UTC. As soon as I saw this picture of a troop of corgis waddling down the beach, I felt better (Hat tip: Redtha's Tumbler, thanks Redtha).